Tirupati is the most visited temple in south whenever the people from all around the state visit every year. Tirupati which is one of the most visited temples of Lord Hindu deity and many individuals have dedicated to this temple. During the Holiday’s peak time and at present it becomes extremely powerful to hunt out accommodation. So we provide tour package to make your temple darshan very simple. 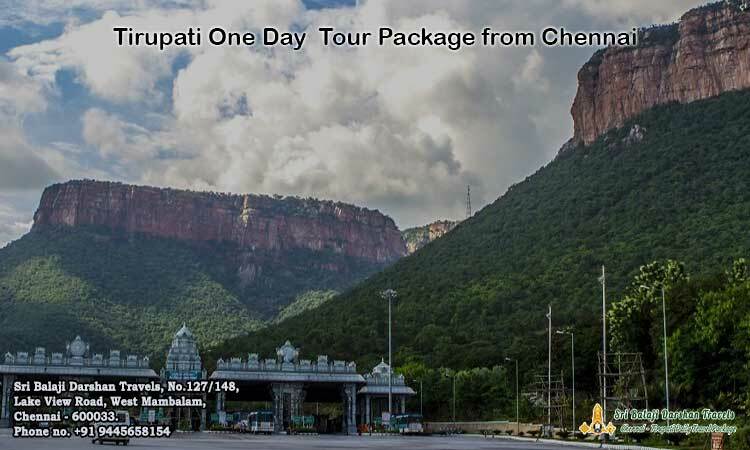 Our One day Tirupati Tour package from Chennai include Tirupati Darshan Ticket, Food, Prasatham for all tickets, Pickup and Drop at your convenient place, Personal guidance to Tonsure or Mottai and guidance to other varies function needs. We also assist you in booking hotels. Daily we offer Special Darshan Packages from Chennai to Tirupati. Based on the requirements you can select your tour package. For car rentals package our well-trained and licensed driver will be assigned to you who will be your driver and also a guide. We make sure that you will get the satisfaction in your travel. Through transportation and hotel facility your trip will be unforgettable. Our package includes Service Tax, Permit Tax, Toll charges, Car Parking charges, and Driver Beta. For special Darshan tickets, we will deliver the prasatham after the Darshan is over. Our travel unit assists you for quick darshan of Tirupathi Venkata Chalapathi. 08.00 a.m – Morning Breakfast at Tirupati. 02.00 p.m – Lunch at Tirupati. If you want any changes in the above programming schedule or are you looking for the best package to One day Tirupati tour from Chennai? You can call our enquiry team @ +91 9445658154. Book your tour package immediately! !